Matt arrived in Shanghai on Tuesday, so it seemed fitting that we go to the football on his first full day. 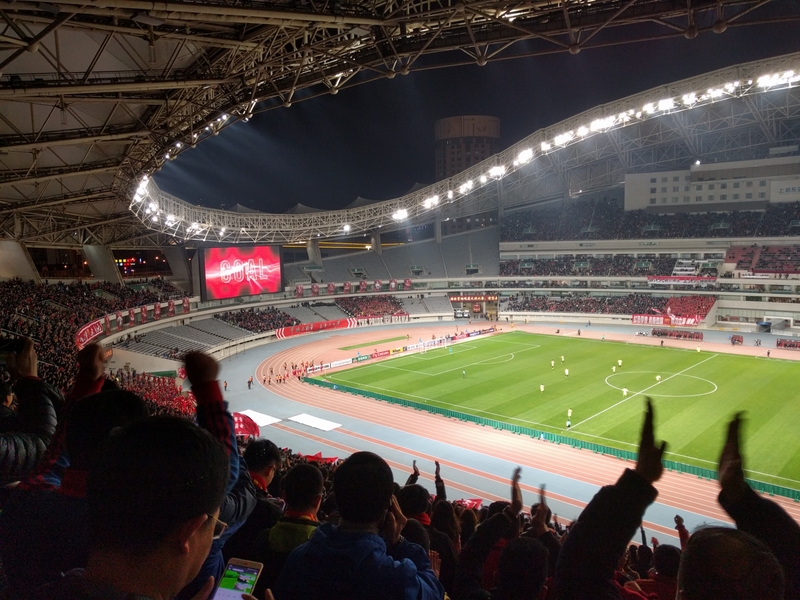 This week the Asian Champions League was on, with one of the big Shanghai clubs – SIPG – left in the tournament, and playing at home. 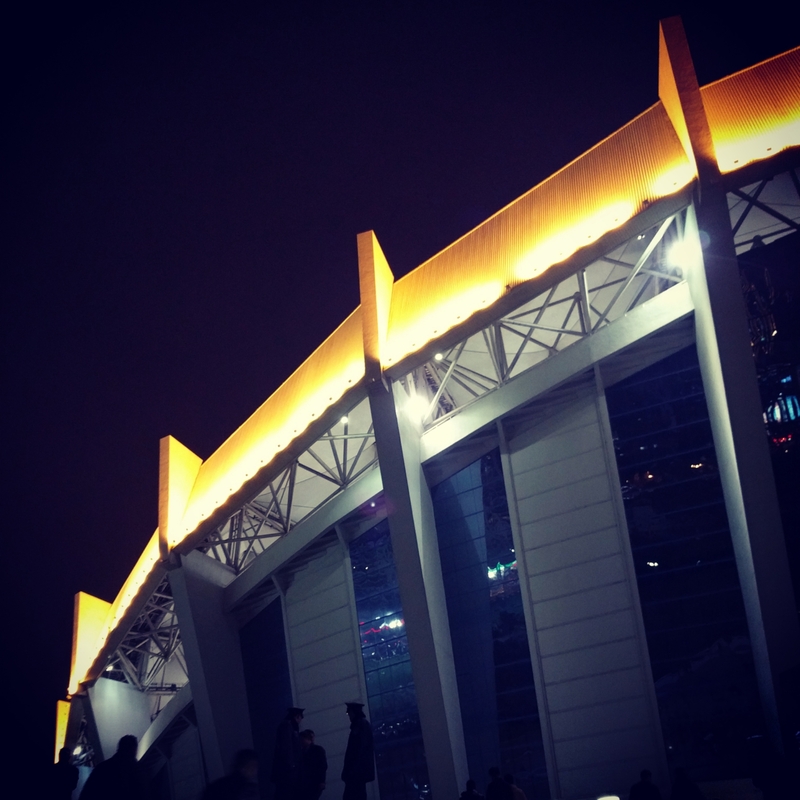 SIPG play at the Shanghai Stadium, and I read that you could just go to the Stadium metro stop and follow the crowds. I was a little apprehensive about it but it was true – we got to the station at about 7.20 and there were lots of people streaming towards the brightly lit stadium. There were a lot of touts milling about but their tickets seemed very expensive so we followed the crowds, looking out for a ticket office. 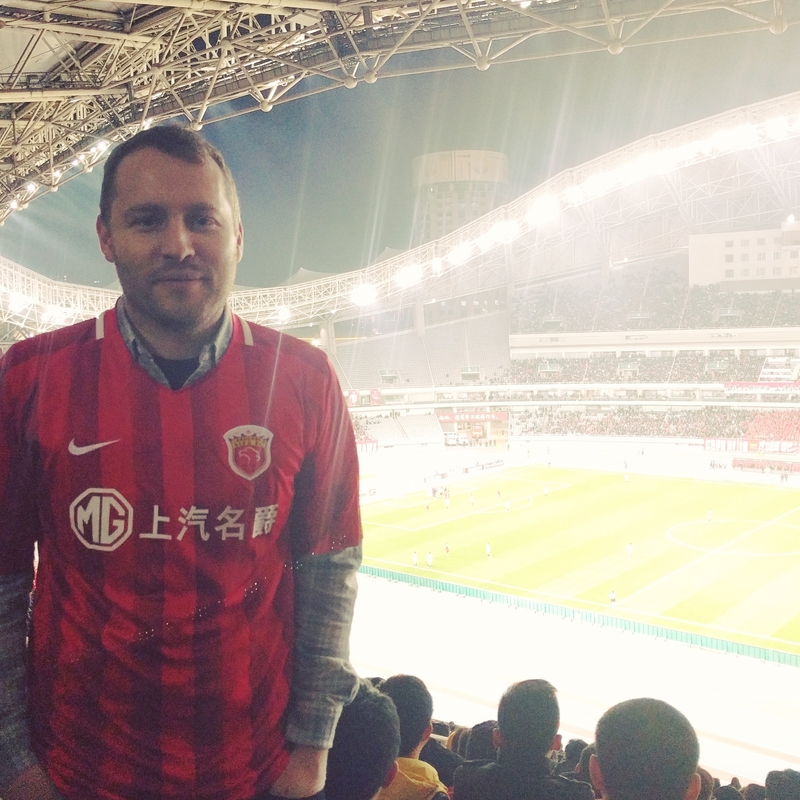 Once in the grounds, Matt spotted a stall selling shirts, the red shirt of SIPG. He asked me to ask how much they were: 35 RMB. That’s about £4. Matt was incredulous, to the point that I thought they might hike the price up. He bought an XL shirt and we went in search of the ticket office. We couldn’t find the ticket office but we did find more touts, and I haggled with them until we found tickets for the price we wanted. “You can speak Chinese!” one tout said, after I’d been bargaining in Chinese for a few minutes. Yes, very observant.Tickets in hand, we bounded up the steps to the stadium. We were in block 19, on the other side of the stadium, so we started running as the match had already kicked off and we could hear lots of cheers from within. We didn’t want to miss any of the action! By the time we got to our seats we were very warm, but were pleased to see we hadn’t missed anything. We found our seats, watched by everyone in the stand, and settled in. Within a minute – GOOOOAAAAL! I have no idea who scored but I jumped up and cheered with everyone else. The stadium was absolutely enormous, with an athletics track encircling the pitch. The pitch also looked like it might have been a sheet of AstroTurf rolled out. SIPG were clearly dominating the game, even to my non-expert eye. In fact, the Urawa Red players seemed to be falling over a lot. The Urawa fans were in one little corner of the stadium, and were jumping up and down en masse. However I couldn’t hear their cheers as the SIPG fans were so loud. Lots of renditions of ‘we will rock you’. Lots of flags, drums and whooping (okay, the whooping was me). By the 80th minute we were a little cold, and the score was 3-1, so we decided to sneak out a little early and beat the rush back to the metro. We found out later that we missed another goal! Back at the metro we picked up a pastel de nata (a bit eggy, but deliciously warm) and Matt fell asleep on the ride home. I’ve now seen 3 football matches in my life: in Reykjavík, Milton Keynes and now Shanghai. I’m pretty happy with that!